ATN Holdings, Inc. (ATN) was incorporated as the Jabpract Mining and Industrial Corporation (JINICO), for the primary purpose of engaging in mining and oil exploration, with an initial authorized capital stock of Two Million Pesos (P2,000,000). On September 13, 1995, SEC approved the increase in authorized capital stock to Two hundred million pesos (P200,000,000) at One centavo (P0.01) per share. On March 14, 1996, Securities and Exchange Commission (SEC), approved the changes of name from Jabpract Mining and Industrial Corporation to ATN Holdings, Incorporated and corporate purpose from mining to a holding company. A change of par from One Centavo (P0.01) per share to One Peso (P1.00) per share was subsequently approved by the SEC in November, 1996. ATN Holdings, Inc. is a real estate developer listed company in the Philippine Stock Exchange. 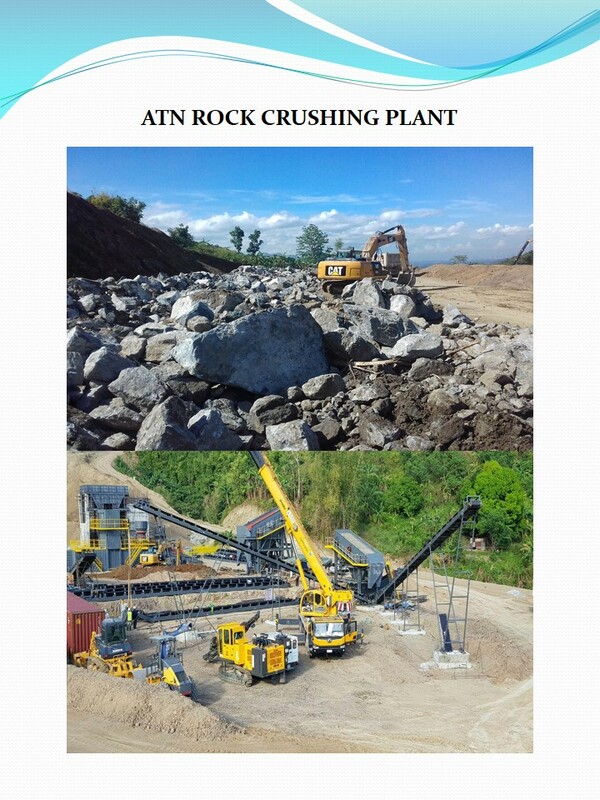 The establishment of the crushed basalt aggregates is part of ATN Holdings, Inc. to maximize utilization of its 254- hectare property in Rodriguez Rizal. The same site contains 400 Metric tons of basalt rock that has found a strategic market in land reclamation projects and construction activities in the adjacent new city being developed by the largest real estate companies in the Philippines, and the infrastructure projects (MRT-7 and C-6 Expressway, etc.) being implemented by the Duterte government under the Build-Build-Build or “Ambisyon 2040” Program. ATN Holdings Inc. (ATNH) envisage the extraction of rock deposit in its 254-hectare property in Rodriguez, Rizal, and establishment of a plant for the production of 2.6 million tons/year of crushed basalt aggregates with intital capacity of 500 tons per hour or 2.6 Mton/year. Due to expected high demand for rocks created by the Build, Build, Build Program of President Duterte, the crusher plant capacity will be expanded by 100% in the following year. ATN invested in real properties and stocks. Its investments in real properties are several units of Summit One Tower located at 530 Shaw Boulevard, Mandaluyong City. Summit One Tower is a 48 storey building. Units of Summit One Tower are office condominium spaces ready for occupancy, with its own separate 6-level parking building and 2 basement parking levels. The units are for sale or leased through either direct sales from walk-in clients, or referrals from independent brokers. 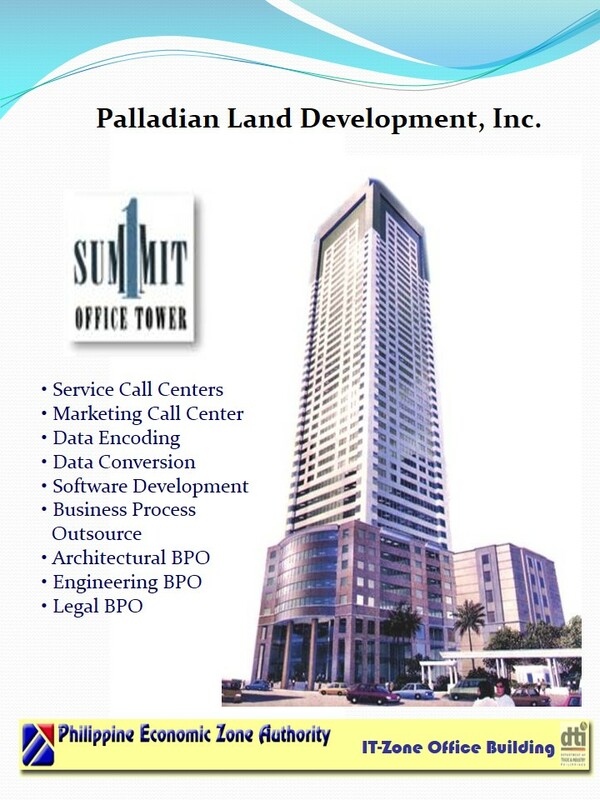 ATN’s subsidiaries are Palladian Land Development Inc. (PLDI), Advanced Home Concept Development Corp. (AHCDC), Managed Care Phils., Inc. (MCPI), and affiliate ATN Philippines Solar Energy Group, Inc.
Palladian Land Development Inc. (PLDI) is the developer and major owner of the 48-storey Summit One Tower and an adjacent 6 storey parking building, located at 530 Shaw Boulevard, Mandaluyong City, subdivided residential land in Pasig City and the owner of 1.3 hectare commercial property located in San Fernando, Pampanga. The 1.3 hectare Pampanga property contains a 3-storey commercial building with usable area of 3,000 square meters. PLDI’s main sources of revenues include sale and rent of condominium units and residential land. PLDI keeps its debt level very low to manage revenue risk. Compliance to environmental laws required Summit One Condominium Tower, which is partly owned by the company as developer, to invest in Membrane Bioreactor (MBR) for waste water treatment. MBR, which exceeds the standards set by DENR for waste water, is state-of-the-art technology used for recycling wastewater in developed countries such as Singapore. Advanced Home Concept Development Corp. (AHCDC) is a corporation engaged in developing residential properties. AHCDC is a developer of various properties around Ever Gotesco in Pasig City. AHCDC keeps its debt level very low to manage revenue risk. 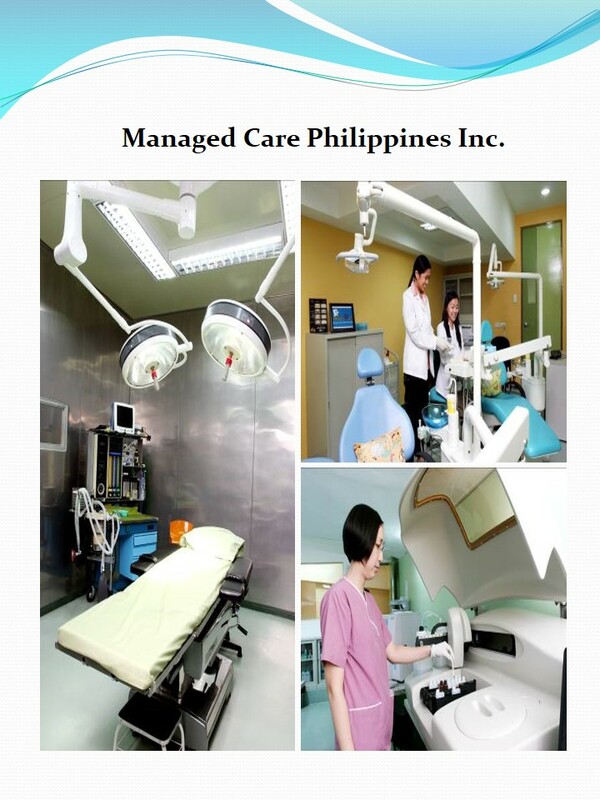 Managed Care Phil. Inc. (MCPI) is duly registered with Dept. of Health under license to operate No. 13-030-13-AS-2. MCPI is a corporation engaged in the healthcare industry with investments in outpatient clinics. One hundred doctors of MCPI manage the healthcare needs of the fifty thousand client patients. The company established a relatively large ambulatory surgical center at the ground floor of the Annex Building of Summit One under the umbrella of its subsidiary MCPI. The new state-of-the-art surgical center includes 14 surgery rooms, 20 consultation rooms, 14 recovery rooms and an x-ray room, equipped with X-ray, 3D ultrasound, ECG, tread mill, dental clinic, etc. Doctors of various surgical disciplines in medical and aesthetic surgery services have committed to practice their respective professions in the center, and 54 HMOs have designated the center to deliver the diagnostic and surgical services required by their members. MCPI keeps its debt level very low to manage revenue risk. In compliance to government DENR regulations on proper waste disposal, MCPI has engaged Integrated Waste Management Inc., a duly DOH/DENR accredited waste disposal company for medical waste. ATN Philippines Solar Energy Group, Inc.is a corporation engaged in renewable and clean energy generation. This company was organized with various ATN Solar individual investors, ATN Holdings and Transpacific Broadband Group International, Inc. ATN Solar will establish a 30–MW Solar PV project in the 256–hectare property of ATN Holdings in Rodriguez Rizal. ATN Solar is working out the interconnection with National Grid Corporation of the Philippines for the distribution of its generated power. The Company is competitive in terms of pricing its real estate properties for sale. Its low leverage allow the company to survive even during a slump in the real-estate market. In addition, the company enjoys PEZA incentives in its Summit One Tower Office Building. The company does not produce any product. It sells real estate property in Summit One Tower and other minor land properties in compliance with real estate laws. Management observes that there is no probable governmental laws that may have significant effect in company operations. The Company and its subsidiaries are the owners of (a) selected units and floors of Summit One Tower at 530 Shaw Boulevard, Mandaluyong City, (b) Lincoln Plaza in San Fernando, Pampanga and (c) land for development in Montalban, Rizal.Due to its high inventory holdings, the company does not intend to acquire or purchase any real estate or major equipment in the next twelve months.